Open Weekend at Habrough Fields in Immingham and The Manor in Gilberdyke on Saturday 18th and Sunday 19th April. Dreaming of a new home in 2015? You’re in luck. To help turn that dream into reality, house builder Peter Ward Homes is holding an Open Weekend on Saturday 18th and Sunday 19th April at Habrough Fields in Immingham and The Manor in Gilberdyke. Over the past few years, the housing market has gone from strength to strength with continuous support from Government schemes such as Help to Buy and the reduced stamp duty rates. Peter Ward Homes are set on helping guide buyers through the process of finding and purchasing their new home as best they can, as it is clear there has never been a more appropriate time to buy a new home. To give buyers a real insight into a Peter Ward Home, both sites each have their own show home available for viewing at the Open Weekend.Four bedroomed detached house, The Sandridge is the current show home at Habrough Fields and is perfect for couples with expanding families or are looking for that extra bit of room. Those visiting The Manor will get an exclusive first look at the new show home, The Hertford, a four bed detached home. This is a perfect choice for those looking for a practical family home in a rural location. Both show homes offer spacious living and come with bi-folding doors, a new feature for Peter Ward Homes, designed to bring the outside inside. 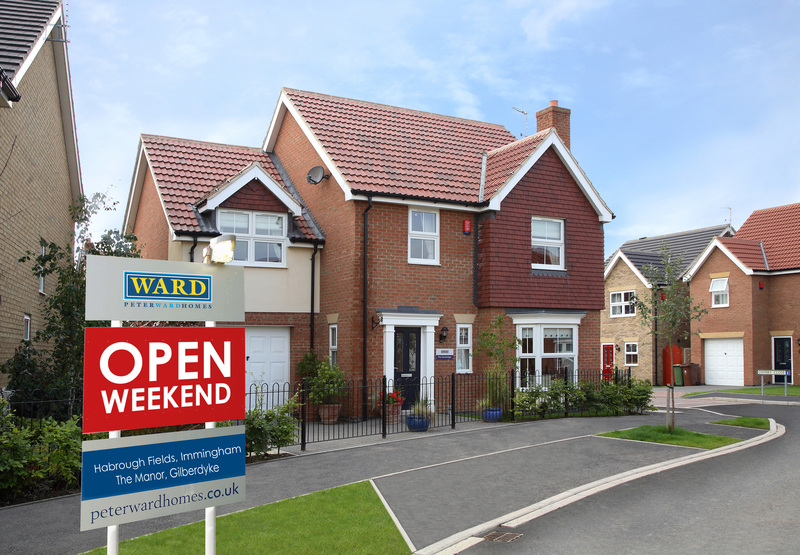 The last time the Open Weekend took place at Habrough Fields, a dozen of buyers reserved homes with most of them following through with a sale. This was an almighty achievement which led to the decision to once again hold an Open Weekend at not one but two sites across North Lincolnshire and East Yorkshire. The number of people going to this weekend is expected to be doubled at both sites. Peter Ward Homes are also giving buyers the chance to create their own style of home with a number of packages and vouchers. Selected plots will qualify for items from the Personal Touches scheme including a range of appliances and electronics such as an LG 50” Full HD LED TV, a family iPad package and an LG brushed steel still standing Fridge Freezer. As well as this anybody reserving a plot, or doing so before the 31st August will receive a voucher for free interior lighting worth up to £1600. Buyers can also select Kitchen and Bathroom tiles from an extensive range. And it doesn’t end there; one lucky individual could be the new owner of a 64 GB iPad air in a free prize draw that can be entered on site or on the Peter Ward Homes Facebook page. Whether you are a first time buyer, looking to move up or down the property ladder or wanting to expand your family, Peter Ward Homes offers a range of house types to fit various lifestyles. With a mixture of two, three, four and five bedroomed homes there really is something for everyone. So don’t miss out on the chance of finding that perfect family home with a variety of extras to make it your very own and make a date in your diary to visit Habrough Fields in Immingham and The Manor in Gilberdyke.